The other week I went to see the film Samba. A film by the creators of Intouchables, the major French film hit of 2011. Samba was advertised with a poster at the bus stop nearby my house and whenever I’d pass by those four smiling faces on it drew me in. That was actually the primary reason for me to go see it, without any further knowledge about the story or the actors I went into the cinema. The audience consisted primarily of women and there was an atmosphere of excitement in the auditorium. It was like everyone was ready for a laugh and to have a good time. These expectations were probably set because of Intouchables, a film with the heaviest of topics (discrimination and incurable illness) but with a sense of humor and lightness to it. And indeed, as soon as the film started, the smallest of jokes evoked the grandest of laughs. While, in fact, many of those jokes were not really that funny. Because like Intouchables, Samba is also a film with a very serious topic. Its main character Samba is a refugee from Senegal who has been living in France for ten years. His story concerns, like that of many others in the film, the impossibly enduring process that refugees are subjected to in obtaining any kind of documents. During these ten years Samba has been able to make a living for himself, working kitchen jobs and laying low and hiding from the authorities. And this is exactly why the sense of humor in which the story is told feels so wry. Samba’s spirit seems indestructible, which makes him the most charming of characters, but a feeling of uncertainty and unfairness is underlying everything that happens in the film. That Samba is able to portray this tough world in a light tone without losing integrity is commendable, as it makes it accessible to a larger audience. To me it was especially striking how the undocumented characters are able to find temporary jobs and even more so how employers are using and abusing them. To these employers the individuals are interchangeable, which is painful to watch. Every day undocumented men wait at particular spots in the city for potential employers to drive by and pick a few men they can use for a day or two. These scenes particularly touched me, because they were completely devoid of any sense of humanity. When I was in London last week to present at an art history conference, I obviously had to make a stop at the National Gallery. Through the entrance, up the main stairs, and first rooms on the right: the modern art collection. Encounters with the usual suspects were alternated with quite some new acquisitions. One of these strongly resonated with Samba; which was George Bellows’ Men of the Docks (1912). Bellows (1882-1925) was an American painter who became known for his realist and raw portrayals of urban life in the New York of the turn of the century. Men of the Docks displays a group of men in the Brooklyn docks. A large ocean steamer is docked in the harbor, while the Manhattan skyline looms in the background. It is a crisp, snowy winter morning and there is really not a lot going on. Except for the men hanging around. The men are waiting for possible employers to come by and offer them employment. Exactly like it happens in the film that is set more than a hundred years later from the painting. The title of the painting is Men of the Docks. It implies that the men do not happen to be there by coincidence, but are part of the life that goes on in the docks. Their presence in that particular place has become a fixed part of their lives and in turn of the business that is going in the docks. It expresses the same kind of hopelessness as those scenes in Samba. Watching this film made the Bellows’ painting come to life, which was a strange, enriching, and truly valuable experience. An unexpected experience, in which the life of the modern metropolis of the early twentieth-century was connected to our self-proclaimed progressive and advanced twenty-first-century society. Samba (2014), directors: Olivier Nakache and Eric Toledano. With a.o. Omar Sy and Charlotte Gainsbourg. 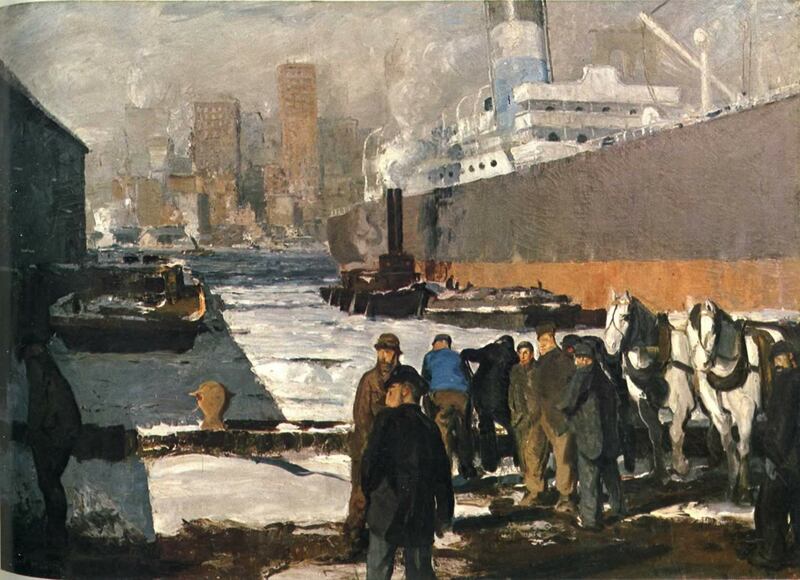 Men of the Docks (1912), painted by George Bellows. On display in the National Gallery, London.